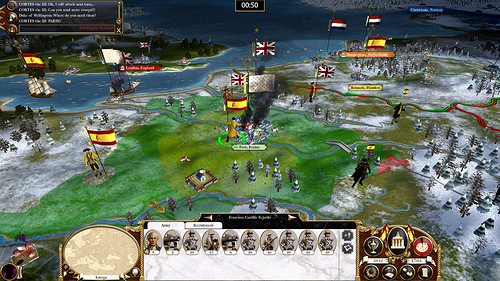 Sega has announced the open beta of Empire: Total War's multiplayer campaign. While the beta is focused on versus combat, there is an option for "comp stomping." * Play on the entire Empire campaign map (All 3 theatres) against another player. * Fight against far improved AI nations, overhauled by update 1.5. * Work together or in competition to dominate the entire Empire campaign map. * Play via LAN or the Internet through Steam. * Engage in diplomacy with AI factions and another player. * Betray or cooperate with a friend or enemy, the choice is yours. * Fight real-time battles against the AI together, or have a friend take the AI’s place in battle for the ultimate tactical challenge! We're still trying to get details on what exactly the multiplayer campaign is, but if there's some ability to co-op in it, you can bet we'll let you know the details. For now, if you own Empire: Total War, head over to the official site and sign up for the beta. Page created in 0.8800 seconds.